Serve this Strawberry Cheesecake Dip at your next party. 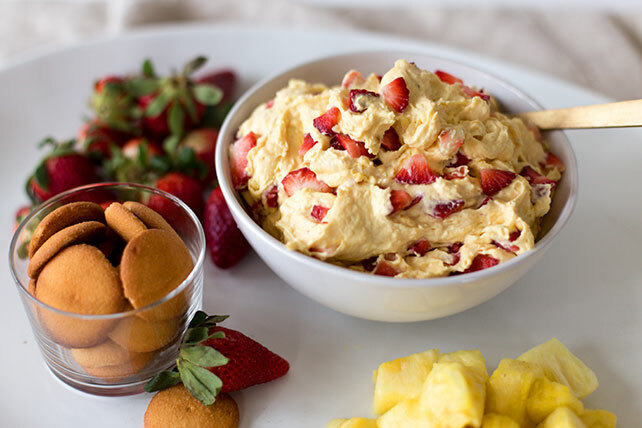 Have copies of this recipe too; you're sure to get requests for this Strawberry Cheesecake Dip! Mix cream cheese, dry pudding mix and milk in large bowl with whisk 2 min. Stir in COOL WHIP and strawberries. Sprinkle with lime zest before serving. Serve with assorted cut-up fresh fruit, vanilla wafers or graham crackers. Freeze scoops of any leftover dip in single layer in waxed paper-lined pan until firm. Transfer to freezer-weight resealable plastic bag. Freeze up to 2 months. Top with additional lime zest before serving with vanilla wafers.